I am always looking for the best way to store all my tea. Tins, jars, boxes, bags. I get tired of all the cardboard boxes of the bagged teas I like. I am not OCD or even all that tidy but I like to think I could be. So here is a round up of a few of my favorite tea storage options. This is my new tea chest (Thank You honey!) from Leo’s Woodworks. It is made from Cheery and the story that came with the box said the wood is from a tree that came down in a storm. 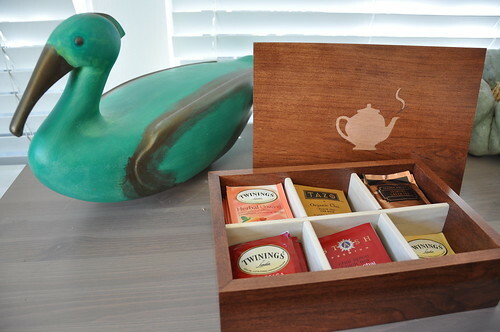 The box is beautiful, very sturdy and came pre-loaded with tea! Only problem is I have to drink it all before I can put my tea in it (tough life I know). There are a few styles and sizes and they are all beautiful. Teal albatross not included. If you like to have your tea in easy reach and want to enjoy the graphic quality of your tea boxes this tea shelf would be great. Made from old wine boxes, this shelf is a clever re-use. From Remnant District Designs. If you drink a lot of loose tea that you order in bulk these tea tins from Specialty Bottle are great. We used the smallest size to make our wedding favors and filled them with a Peach Black Tea. How much fun would it be to design your own labels?! Now that I am all organized (in my mind anyway) it is time for another cuppa!